Pool repair kit Use to repair your vinyl swimming pools, inflatable air mattress, and floating toys Two part heavy duty repair kit of 2-3/4-Inch by 7-3/4-Inch vinyl sheet and cement Carded..
Quick-Fill AC Electric Pump Supplied with 3 Interconnecting nozzles to fit most applications Compact pump CE approved 220-240 volt..
Intex Kids Travel Bed Set – 66810 – 107 X 168 X 25cm – White uses standard crib sheets Case Weight: 13.3kg Inflates and deflates quickly Include carry bag Shelf Box. FEATURE – Inner mattress approximate size 69 x 132 x 10cms. 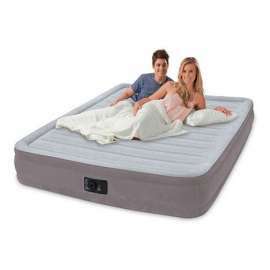 – Outer mattress approximate size 107 x 168 x 25cms. – Duffel bag for easy transport. – Inflat.. Durable car SUV equipment for comfortable travel sleeping for kid and partent, or create more room for romantic intimate motion in vechicles Folded volume: 25cm x 22cm x10cm Mattress Spread to Size: length 115-130cm, width 85-90cm Height: 38cm-43cm, Mattress Thickness: 8cm, Maximum Load bearing: 800 lbs Includes car electric a.. Product Description IFeaturing the innovative high-strength dura-beam technology. 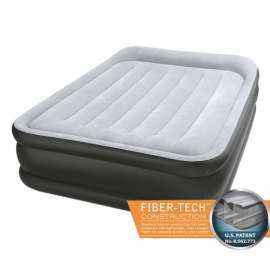 Unlike traditional airbed construction, these internal support beams comprise polyester fibres that do not stretch over time which improves durability and comfort. Elevated for convenience it's two tone colour is pleasing to the eye. It is finished with soft plush ..
Inflatable Queen airbed for home use engineered with Fiber-Tech(TM) ConstructionBuilt-in, high-powered electric pump for hassle-free inflation and deflation, inflates mattress in approximately 4 and 1/2 minutes to the desired firmnessWaterproof flocked top raised 22 inches from floor with indented sides to keep your fitted sheets from slippingDuffe..